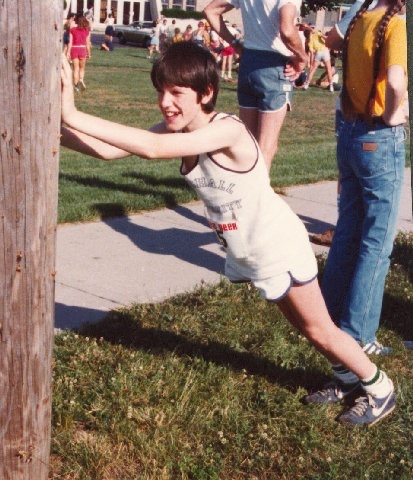 Warming up for my first road race, the Fourth of July Five Miler in Irondequoit, New York, 1980. If you are reading this, you have stumbled upon yet another blog about running. Before you go back to playing Words With Friends or laughing at the mishaps of anthropomorphized felines, let me win you over by briefly explaining why I am doing this. This is a blog for masters runners who run for reasons that go beyond merely getting fit. We like running fast and figuring out how to get faster. We’re competitive – but usually more so with ourselves than with other runners. Although we do throw in surges, kick to the finish, and stay around to receive our age group awards, we are usually more thrilled with a new PR. I run because I like to run. This has gotten me in trouble in the past during my scheduled rest days… I like to think that we make local road races more honest, so that the young guys can look at the results and realize that winning was not just a matter of showing up. I’ll blog more about the intersection of the meaning of competition and the meaning of running in the months ahead. I’m not going to claim that you should read this blog because the subject matter will be unique, or that I will have a completely new approach to the topic – there are, after all, many running blogs out there. My intention is to write about running from the perspective of the mid-forties, mid-level runner, who is doing his utmost to get faster as he gets older. One of the services that I intend to provide is to sift through the many technical running blogs out there to arrive at some practical information that is useful to the masters runner. I also intend to start discussions about training and racing issues to hear directly from masters runners about how they have approached various problems. Look down. I’m starting this approach with some stories and requests for advice about leg cramping during races – not fun. I have been meaning to write a running blog for months, but have had trouble getting started. I think that part of problem was the ill-conceived idea that I thought I needed to write a blog that would fill a very precise niche in the running community and that to facilitate this I would need to start by issuing some sort of running manifesto. You know the drill: what does running mean to me, what are our foundational assumptions, what does this blog intend to contribute to the dizzying amount of writing on running that already exists. Not only was creating a manifesto far too much pressure, but I think it also threatened the reason to blog in the first place: to explore a variety of topics and ideas about running to help contribute to a more enjoyable pursuit for the mid-level masters runner. (OK, so that sounds a little bit like a manifesto…) So, this might be the way to start. I’m writing a blog that will take my individual running experiences as a way to explore larger running concerns in what will ultimately be a collaborative attempt to facilitate better running experiences for the readers of this blog. One of the critical touchstones for my thinking about running is Dr. George Sheehan’s oft-repeated quote, “You are an experiment-of-one.” True, but we can also add up our experiences or experiments to arrive at some best practices. You are an experiment of one; but you also need to realize that this is a community endeavor – the successful runner is surrounded by support and seeks out competition, friendship, and advice. I’m going to get right to it, because this preamble stuff is beginning to sap my desire to write. I’ll leave the introductions to subsequent blogs – you can get to know me as I write. On October 7, 2012, I ran in the Hudson Mohawk Half Marathon in Albany, New York. Through nine miles I was on pace for an 1:30 half marathon. This was my first half, so I had given myself a goal of getting under 1:40. I probably started a bit too quickly and noticed when glancing at my Garmin that my splits up to 15K starting at four miles were under my previous PRs. I was running well. The perfect weather for me – mid-50s, as well as a flat course made it difficult to run conservatively. There was also some racing going on. I was back and forth with a group of guys around six miles and was passed by one of the top women’s masters runners in the region at around seven miles. I could not keep up, but was still running well. We really started to string out after eight miles and I found myself running alone, unable to attach to anyone in front of me and unwilling to slow down to run with the people behind me. This is how things went for the next several miles. I was, however, gradually inching up on runners in front of me, and I was gaining confidence that I was going to be able to do some catching and passing during the last several miles. I also felt that 1:30 was still within my grasp. I felt strong and was gaining confidence. Then, I felt a slight twinge in my left calf. I had to slow down. Next, I felt more than a twinge in my left hamstring. I was forced to slow down. Yes, for the final three miles of the race I experienced intermittent cramps in my calves and hamstrings that brought me to abrupt slowdowns and made it difficult to maintain any type of pace. I lost several places and was forced into an odd heel-first sprint during the final meters to avoid being passed. Ultimately, however, I was happy with my final time of just under 1:34. I really can’t complain about my first half marathon experience, but the final miles were painful and frustrating. Around eleven miles I was telling myself that I probably didn’t need to do this again. Maybe 5K was really my distance. After a massage and some chocolate milk, however, I soon realized that I wanted another crack at the half and was thinking that my next goal should be a sub 1:30. Obviously, I will need to address the cramping problems and here is where the collaborative part of this blog comes into play. Let’s talk about leg cramps. This has happened to me previously only twice before. The first time was at the very end of a 5K in hot, notably humid, weather. I was kicking during the last two hundred meters and felt a crampy twinge in my hamstring. I had to back off, but managed to make it to the finish line without anything popping. I didn’t even feel any soreness after the race. The second time was at the Bill Robinson Masters 10K just after the halfway mark when the course goes up a very long gradual hill. As a started up the hill, I felt my hamstrings start to cramp and I had to slow down, which was frustrating because I wasn’t going all that fast to begin with. I chalked these cramps up to having gone down the hill (it is an out and back course) at a ridiculously fast pace (I was flying – this is how the pros feel!) and my legs were now trashed. Luckily, I was able to gradually get back to speed. A good thing, too, because it was cold and I sure didn’t want to limp three miles back to the finish. So, here’s the discussion topic: When have you experienced leg cramps, how did you deal with them at the time, and how have you tried to prevent them? Additional: After I got most of this blog written, I raced in the Albany Running Exchange’s FRUN 10K last weekend (November 4) and again experienced hamstring cramps that started even earlier (around four miles) and were very frustrating, because I was running very well, but couldn’t maintain the pace when my hamstrings kept feeling like they were about to pop. It is now clear that this is a problem that I need to get under control. Any advice would be appreciated.